So far, most of the discussions about Veracity have been about its DVCS abilities. I thought I’d talk a bit about the other side of Veracity, the bug/work tracking side, from the users’ point of view. I’ll start with the Activity Stream. Since the work item activity is distributed, bugs may be added and updated from multiple machines, sometimes behind-the-scenes, sometimes offline (I’m sitting in an airport right now, waiting to act out the canonical “dev on a plane” DVCS scenario). When should email be sent? By whom? Cross-platform email support would take time away from features we really want in the first release. We all get enough email as it is. There are less-irritating ways to keep people in the loop. Of course, Veracity has really nice search and filter tools, allowing you to see bugs assigned to you; bugs you need to verify; what’s up for you in the next sprint; any bug mentioning “snickers” or stamped with “SOOPER URGENT”; etc. But we also wanted to give you a view of what’s going on with your project in a more ambient way, so we added the Activity Stream. Every 30 seconds, if anything new of interest has happened in your repository, it quietly updates to let you know. The goal of the activity stream is to be useful, as opposed to complete. If you look at the activity stream side-by-side with our version control history graph, you’ll notice that rev #7 isn’t listed, even though it’s the latest. Why not? Its comment was simply “merge”. That’s not terribly interesting, you probably don’t care, so we hide it. We also hide no-op work item updates, successful builds (our continuous integration setup spins those out constantly, and they’d push the more-urgent stuff off screen), etc. you’ll only see work items where your username is either the Reporter, Assignee, or Verifier, or where the item has been stamped with your username. You’ll still see all commits, since other people’s commits are certainly likely to be of interest to you. 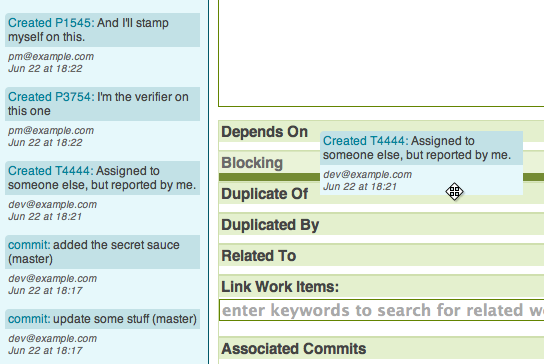 You’ll also still see your own commits, which are not likely to surprise you, so that you can drag them around. Veracity work items can be related to each other (this depends on that, this is a duplicate of the other, etc.). They can also be associated with version control commits – check in some changes, mark the relevant bug. All that is nicely searchable in the work item edit page, but when you want to associate with another recent bug, or with a recent commit, why type anything? You’re already looking at that item in the stream, so just drag it into the appropriate slot and Save. Note that the titles are live links to the relevant Veracity work item, changeset detail, etc. pages. As ever, feedback, questions, and suggestions are very much welcome on the Veracity users mailing list. Drop in.